We are eating fruit from the garden: plums, raspberries and apples. 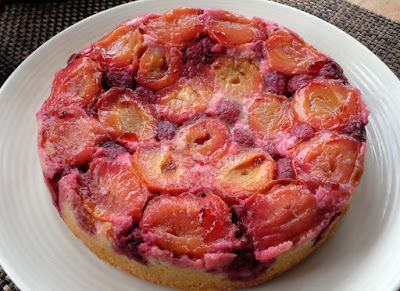 I made this Upside Down Plum and Raspberry Cake quite recently. When I removed the baking parchment paper to reveal the fruit topped cake, it was vibrant and glistening beautifully from the fresh fruit natural juices. However, it was the following day when we took the photograph, it had lost its sparkle. I was a tad disappointed and wish I had taken the photograph the evening before, but it had got a bit too dark. So I feel somewhat that the cake is not shown in its best light. Still it tasted good. If I make this cake again, I would just do one thing differently. 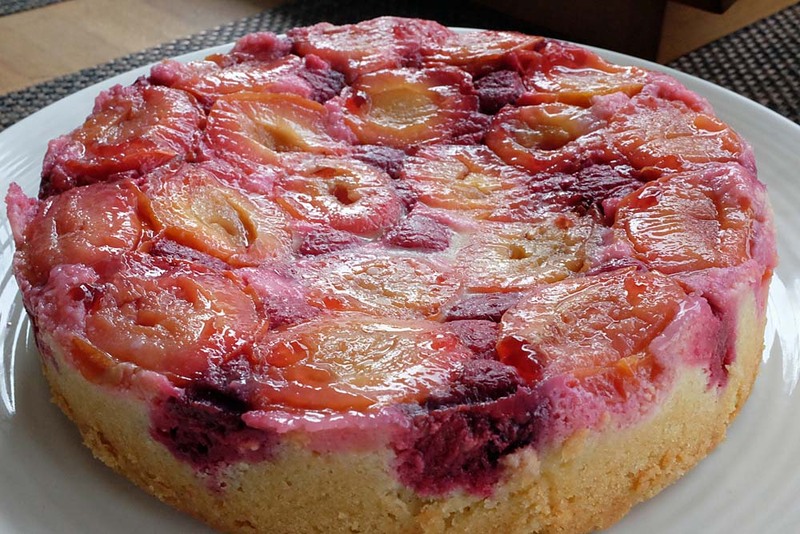 I would keep the stoned fruit on the side, around the edges and the raspberries in the middle because even though the cake was cooked, the middle was a bit soggy and you'd be worried if it was raw or soggy. But a 8 inch round cake tin, lined with baking parchment paper and grease the sides with butter. In a small bowl, add 75g sugar and carefully stir in the plums to coat. Then arrange the fruit in the cake tin face down, including the raspberries if using. Wrap the outside of the tin with foil as there will be some fruit leakage. Now in another bowl, whisk the butter and sugar together until light and fluffy, then add the eggs one at a time, mixing until fully incorporated, then sift in the flour, salt and baking powder until well combined. Carefully spread evenly over the fruit . Bake in oven for 30 - 40 minutes or until golden and skewer comes out clean. Allow the cake to cool for 30 minutes before attempting to turn the cake out onto a plate. Remove the baking parchment paper and serve warm with ice-cream or thick double cream. This makes me feel really nostalgic - my mum used to make upside down cakes when I was a kid, and I remember making them myself in home economics. A plum version sounds divine. What a stunning cake. I love upside down cakes! Thank you. I would make it again for sure. Thank you. I thought it was pretty too.